Time to get ready for returning migrants! One of the earlier returning birds is also one of the friendliest and most social — the pretty and chatty Purple martin. Over one million North Americans put up houses each year for Martins, so if you haven’t tried attracting them to your yard, now is a perfect time to start as Purple martins will send scouts out early to find suitable housing. These scouts will do flyovers of your martin house and if they find it acceptable, will bring more birds to nest in it. Purple Martins spend their winters in Brazil and migrate back to their breeding grounds each spring where they are highly dependent on human built nest boxes in which to raise a family. Purple martins nest in colonies and having an active martin house in your yard will provide hours of entertainment as these birds are a lot of fun to watch and listen to. They also eat a wide variety of insects, so attracting a colony could mean a noticeable drop in the number of bugs in your yard. Assessing your backyard habitat for Martins is the first step in attracting a colony to your yard, as Purple martins can be a little picky. 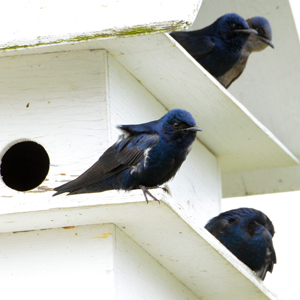 The folks at The Purple Martin Conservation Association have lots of tips for successful martin housing and rearing of broods, and you should check out this site. The basics to consider are that they prefer broad, open areas around their house for at least 30 feet in all directions so they can hunt for bugs without any obstructions and see approaching predators. Plus, they like to be high off the ground — typically around 10-17 feet. Make sure there are no overhanging branches or anything that might permit a snake to gain access to their home – this is a big deal and I have experienced this issue as they have scouted my house and rejected it as a result. This year I made sure that offending branch has been clipped so as not to scare them off again! Centuries ago, Native Americans used hollowed-out gourds to attract Purple Martins to nest, and to this day, gourds remain one of the best nesting cavities for Martins. Many Purple Martin landlords will tell you that they prefer gourds to houses for a few reasons. Gourds sway in the wind, which Martins prefer, but the cavity-stealing House Sparrow does not. But some people prefer to have a traditional Purple martin house with many apartments. You can purchase one from a retailer or even build one yourself. These are a bit more long lasting than gourds, although there are PVC gourds which are virtually indestructible. 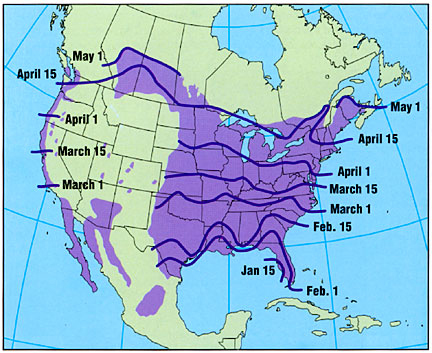 Where you live in North America will determine when you should see Purple martins in your area and when to put up their house. They typically return to the southeast in mid-January and make it up to Canada in mid-April. You can use this rough estimate map of arrival dates to get a sense of when to put up your martin house. If you get it up too early, you may get house sparrows. Too late, and you may have missed the scouting expedition. You can leave your boxes up into early September as young birds may be checking out new places to return to in the spring. Purple martin colonies are a lovely addition to your yard so try your hand at attracting these wonderful birds this year.